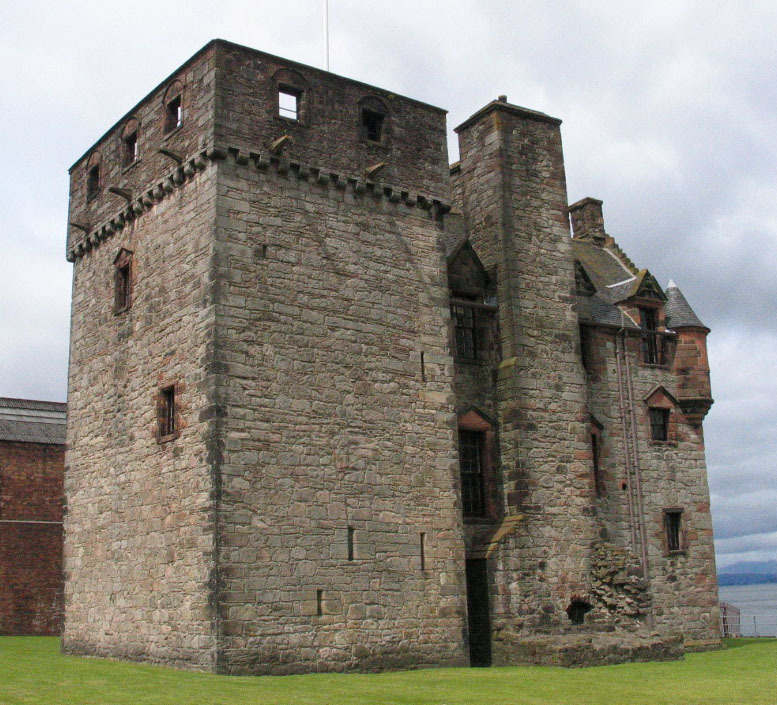 From being a small community which grew around the new castle of Newark on the bank of the River Clyde, near Finlaystone, in the 1400s, home to the Maxwell family, and which took its name from the castle, Newark developed into a busy and important centre of shipbuilding in Scotland. In 1668 it became the port for the city of Glasgow, Newport, to handle the shipping trade for that city, because the Clyde was too narrow to allow the sailing ships to dock any further up the river. Trade with the United States of America in sugar,cotton, tobacco, and timber was growing significantly. In 1667 the City of Glasgow leased a piece land from Sir Patrick Maxwell, to the west of Newark. 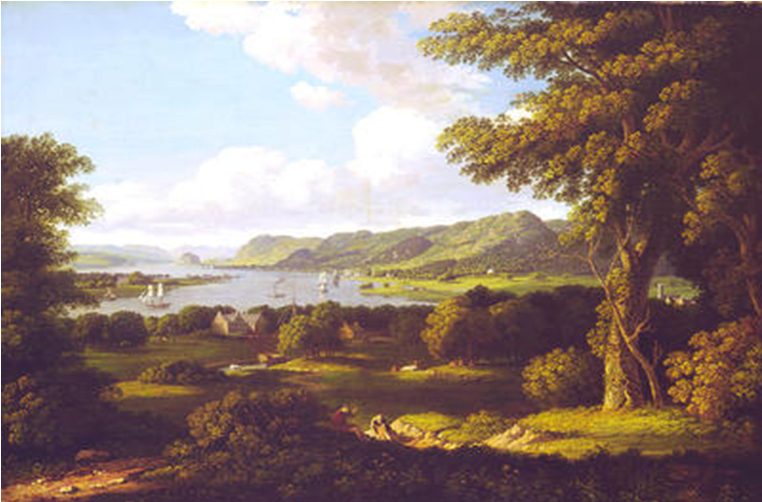 A new port was built there, and two villages developed, Newark and Newport. 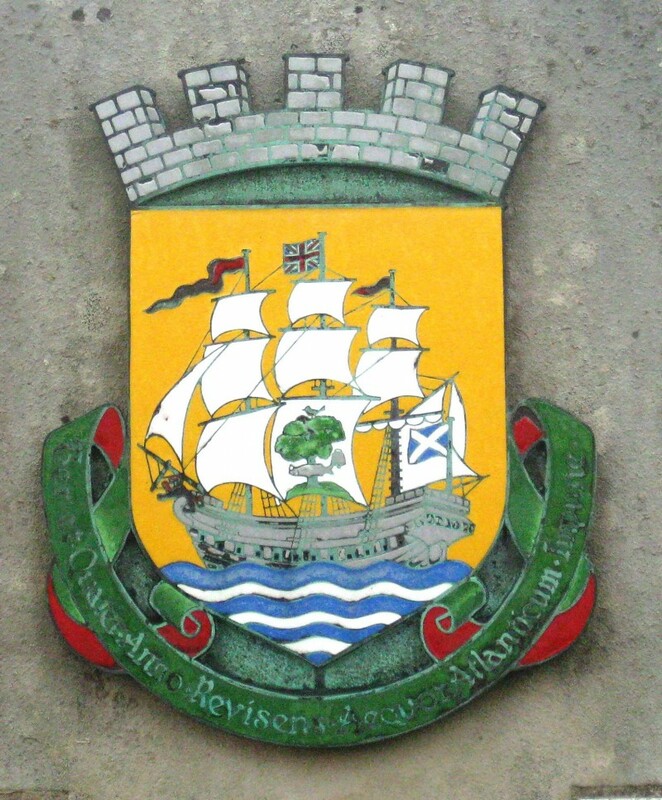 In 1775 it became known as Port Glasgow, a town of some significance, with the first dry dock in Scotland in 1762. The north face of Newark Castle today (2014). Now in the care of Historic Scotland, it is open to visitors from the beginning of April until the end of September. 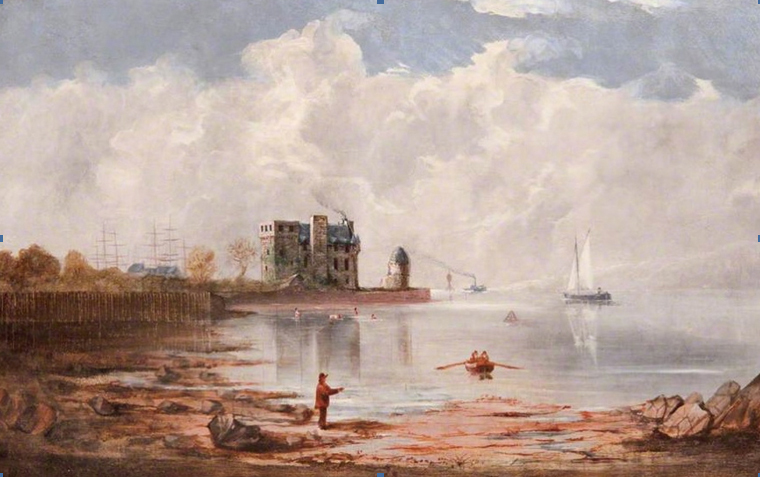 Newark Castle was originally built as a tower house in the fifteenth century, and extended in the seventeenth century and again in 1848. Alongside it remains the last of the Clyde’s operational shipyards, Ferguson’s. Sadly, Ferguson’s went into administration in mid-2014, but was taken over shortly afterwards by Clyde Blowers and now appears to be back in business with an order for a ‘hybrid’ ferry vessel from Caledonian MacBrayne. Shipbuilding had become a major source of industry. 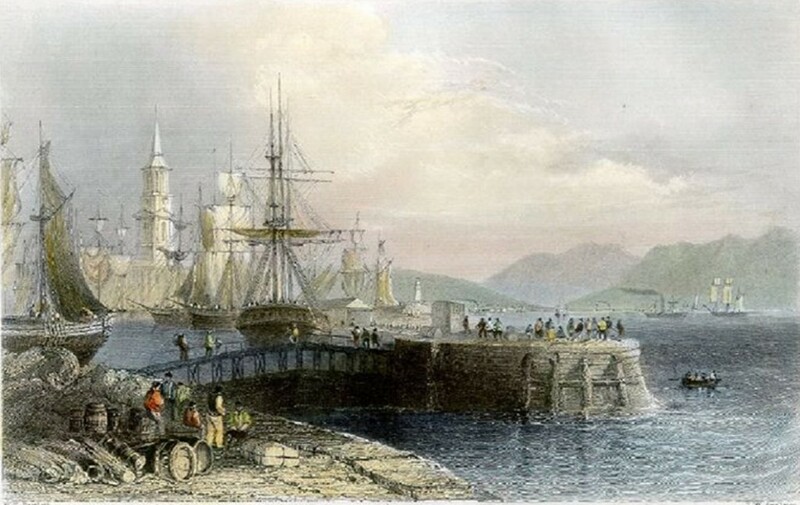 Two harbours were built in 1762, and Port Glasgow had the first graving dock (drydock) in the country, also built in 1762. The main street of the town ran parallel with the shore, with housing built in a grid pattern behind it. The town expanded up the steep hill behind it to form such areas as Park Farm, Boglestone and Devol. Port Glasgow graving dock (postcard from McLean Museum and Art Gallery). 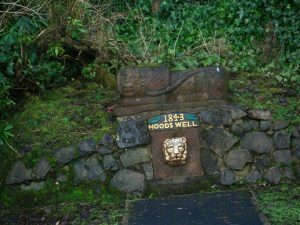 Sited at the foot of the present John Wood Street, it now lies under a car park. 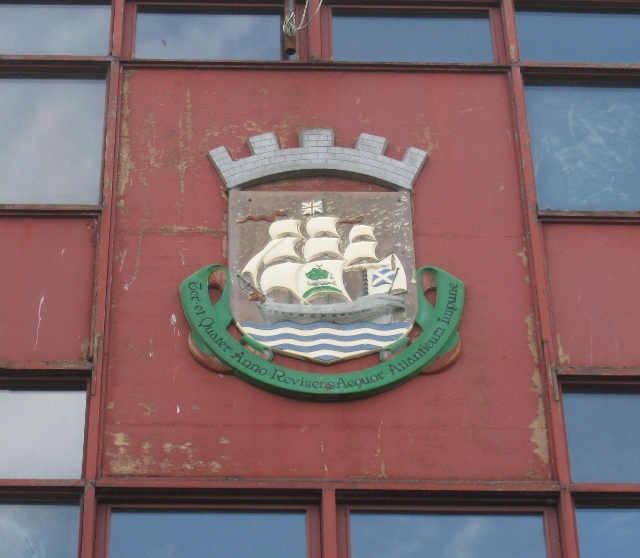 Related industries developed around the harbour area – sawmills, ropeworks, sail cloth manufacture, chain cable, foundries for ironwork, sugar houses, and bonded warehouses. 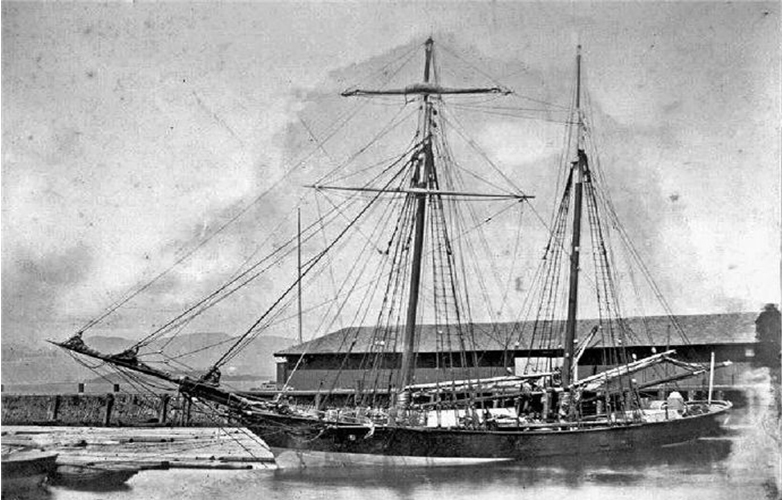 Imported timber from North America was unloaded and chained into rafts. These tree-length logs were stored in the water to season and preserve them. 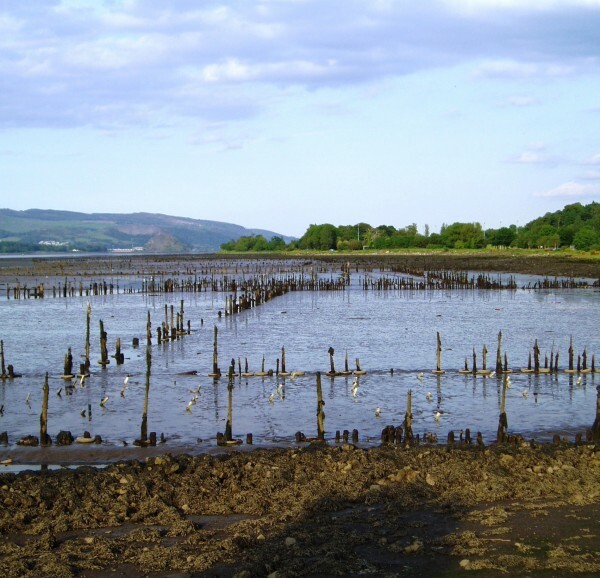 The timber ponds stretched between Newark Castle to Langbank, and today the rotten stumps of the posts which contained them in the water can still be seen. 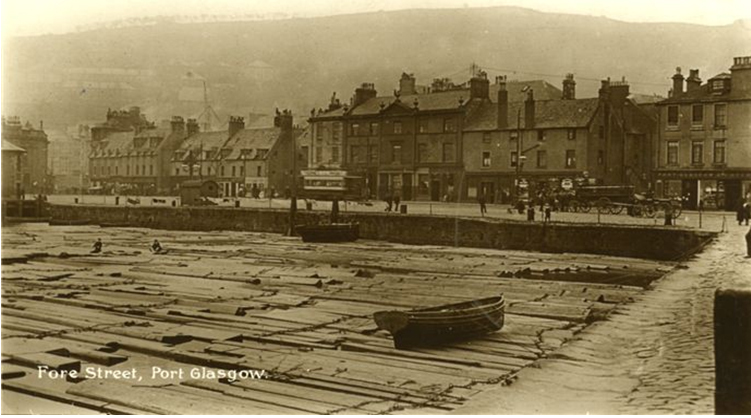 Fore Street, Port Glasgow, the harbour filled with logs of timber, chained together, before being towed to the timber ponds. Eventually precut timber and precision steel construction by 1914 meant that the practice stopped. 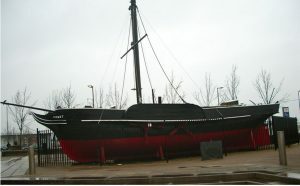 A major turning point in the town’s history came in 1811, when Henry Bell commissioned John Wood & Co. of Port Glasgow to build “Comet”, the first commercial steam-powered vessel in Europe. 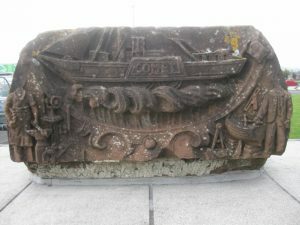 Launched in 1812, it made the first passenger-carrying steam sailing in Europe, from Port Glasgow to the Broomielaw, and then back down to Greenock, greatly reducing the journey time. History was made. In 1962 the 150th anniversary was also marked with style. A full-scale working replica was made. The wooden hull was built by G. Thomson of Buckie, and it then came to Lithgow’s Kingston Yard to have its engine fitted by apprentices. The new engine was made at J. G. Kincaid & Co. Ltd. after research at the Science Museum in London. It was launched on 1st September, with its passengers dressed in period costume, and sailed successfully to Helensburgh and back. 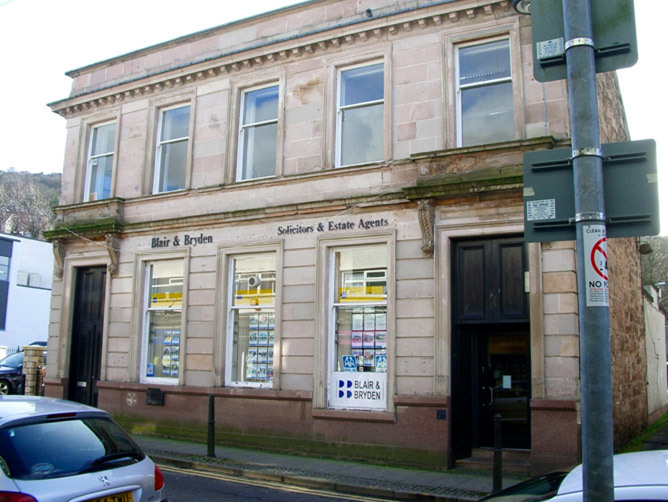 Link to Inverclyde video films, see :1)P.S. Comet 2) Comet Film – Buckie Interview which shows the building of the replica. 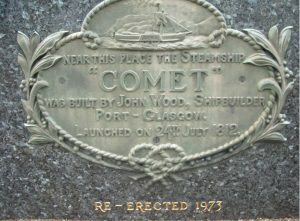 The plaque made in honour of John Wood, builder of the Comet, at the time of the 1912 anniversary, has been restored and erected in front of the Comet replica. 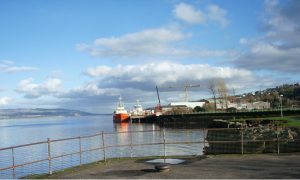 Port Glasgow Harbour, “Svanen”. 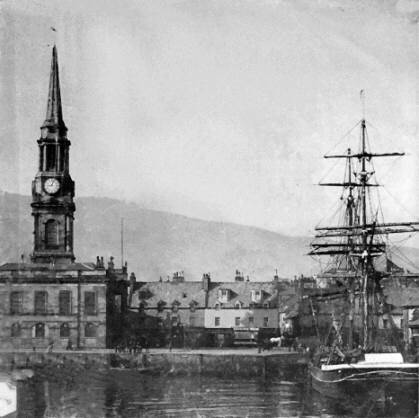 (McLean Museum, Greenock)This photograph also shows Port Glasgow’s distinctive Town Building, designed by architect David Hamilton. Built by public subscription 1815-16, It has a handsome Doric portico and 150 foot high classical steeple, crowned by a splendid copper weather vane, a six foot model of a fully rigged sailing ship. The present-day building is now well inland! 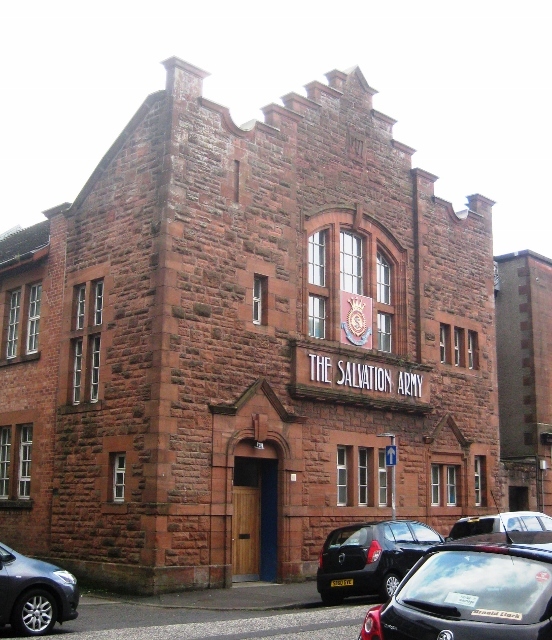 In 1882 the Russell, Lithgow & Anderson Rodger Company took over the former Henry Murray operation at Port Glasgow, and the ‘Kingston’ yard came into being. 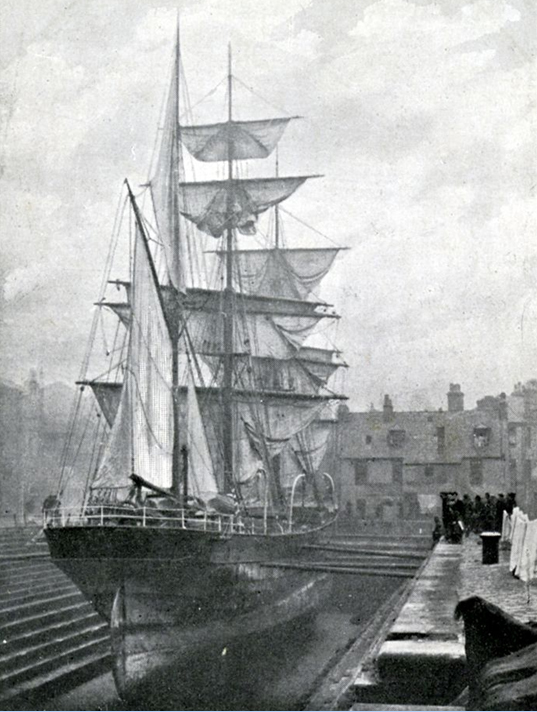 Between 1882-1892, 219 sailing ships were launched. Ferguson’s yard came into being in the 1880s, and is now the last remaining operational yard, following a takeover by Clyde Blowers in 2014. By the 19th century, the Clyde was dredged, widened and deepened to allow large ships to sail all the way up to Glasgow, and the town was no longer needed as a port. New road and rail links added to this change of use. Shipbuilding became the main industry and source of employment. This was the ‘age of steam’. Steam power applied to railway engines and ships was the catalyst for a huge change in the way of life for everyone, not just in work and employment, but also in the way life was lived. For the first time people could move about the country. Travelling was not just for the wealthy, who could afford carriages or even a horse to ride, but now the working man and his family had an affordable means of getting from one place to another. The men who were building these engines, trains and boats could make use of them. 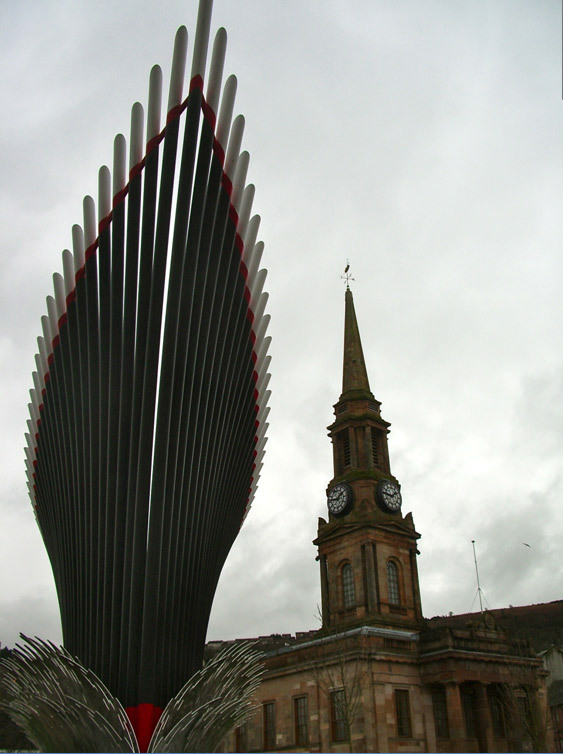 Travelling times were so reduced that for the first time it was possible to plan to go from Port Glasgow to Glasgow city, and come back the same day. Ordinary folk could go away for the day, could ‘sail doon the watter’, could take a train to Greenock, and board a steam paddler to sail to Dunoon, could even consider the idea of going for a holiday on the Clyde coast. And go away they did, in their droves, especially at the times of the annual Trade Fair Holidays. The Clyde was full of steam paddle boats, plying from Glasgow itself, or Greenock, Gourock , and Wemyss Bay where the railway companies of the time were building extensive terminals for the combined rail and pier services. The railway comes to Port Glasgow. 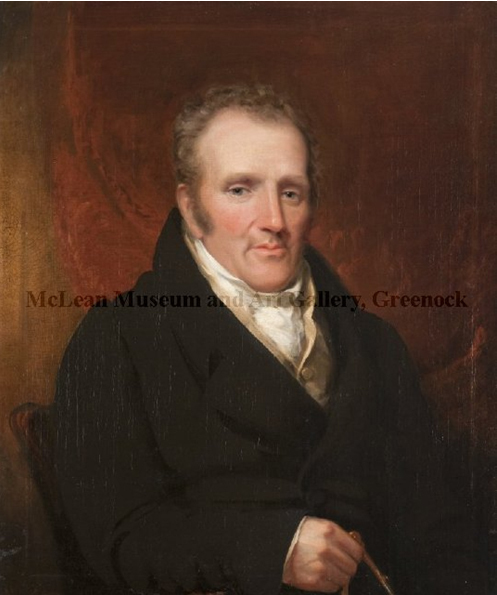 In 1841 the Glasgow, Paisley & Greenock Railway Company built its line to Greenock. The one-hour journey by train to the coast cut travelling time considerably, and enabled people to spend their leisure time even further afield than ever. Taking the train from the centre of grimy, smoky industrial Glasgow meant you arrived at the piers of Greenock, Gourock and Wemyss Bay in an hour, as opposed to 2 or 3 hours by boat. You could then board a steamer to sail across the balmier reaches of the Clyde to such growing resorts as Helensburgh, Kirn, Dunoon, and even Rothesay, Largs Ayr and Arran were a possibility. Small coastal villages developed into seaside resorts, with facilities to entertain the holidaymakers and visitors. In 1847 the Caledonian Railway amalgamated with the Glasgow, Paisley and Greenock Railway. 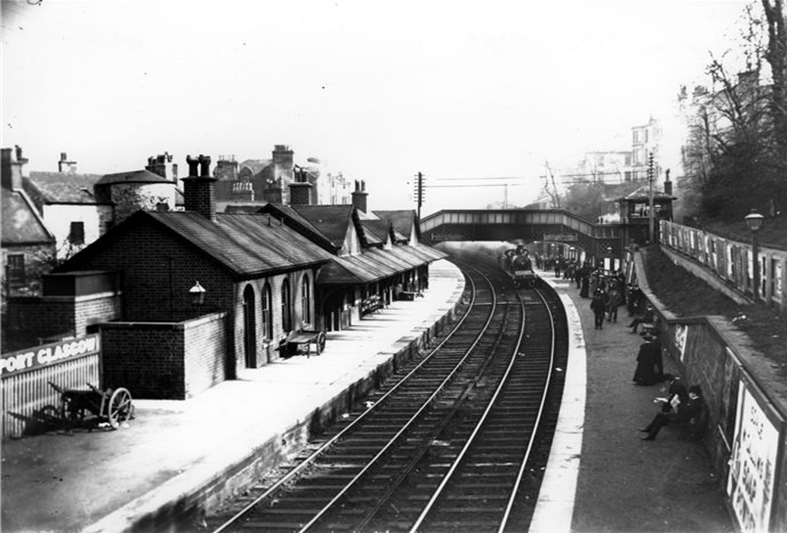 Later it also amalgamated with Greenock and Wemyss Bay Railway to run trains to Wemyss Bay from 1865. 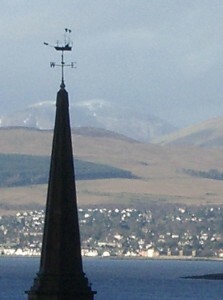 Port Glasgow thus became an interchange for rail traffic between Greenock and Wemyss Bay, and eventually the Greenock line was extended to Gourock. 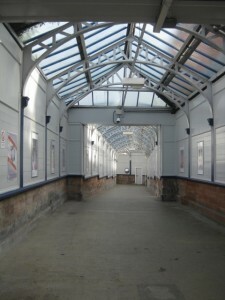 The glass-covered walkway leading from the street into the station at Port Glasgow, protecting travellers from the worst of the Scottish weather. 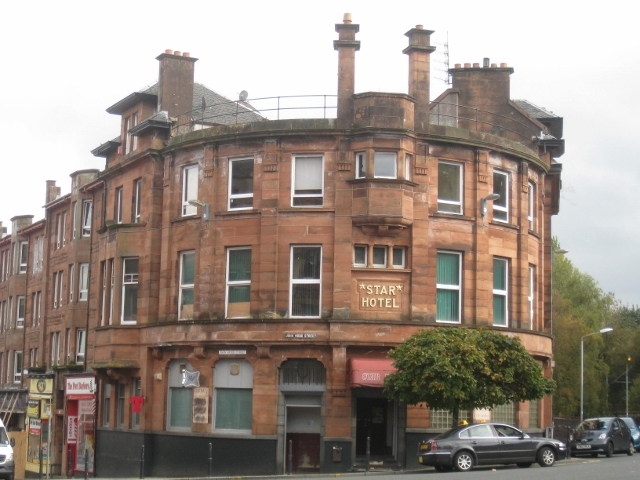 In earlier days, the side walls were decorated with posters advertising the pleasures of holidays by the Clyde, and sailing “doon the watter”. One of ScotRail’s new Class 380 trains approaches Port Glasgow Station, heading for Glasgow. March 2014. Port Glasgow Station, February 2014. 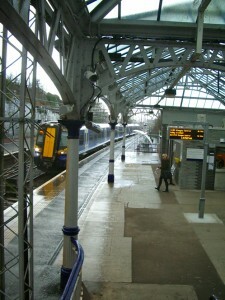 The station was recently refurbished in the colours of the current operating company, First ScotRail, blue and silver. 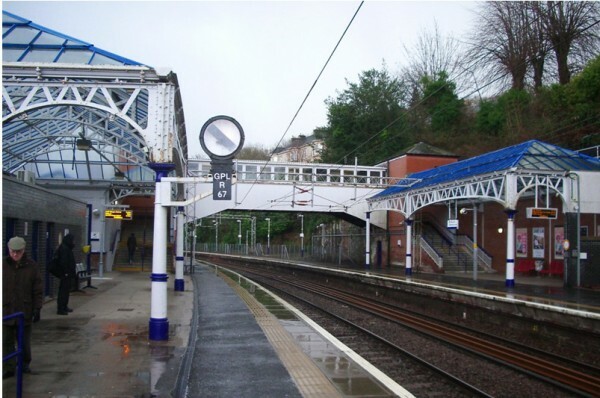 The cast iron glazed canopies installed by the Caledonian Railway Company in 1911 have survived, although the original booking office is no longer in use for that purpose. The town centre has seen several periods of ‘improvements’. From a population of 6000 in the late 18th century, it grew to over 16,000 by the beginning of the 20th century, crowded into the same small area near the shore. The Lithgow family financed a re-modelling of the town centre around 1909-12, but housing eventually had to be extended up the steep hills surrounding the town centre: farmlands at Devol, Boglestone, Park Farm and Bardrainney were taken into the town boundary after WWI, and over 1000 new houses were built by 1953. A new housing scheme was also begun at Woodhall in 1936 to alleviate overcrowding. A Development Plan approved in 1954 led to new council house building at Upper Park Farm in the 1960s, Slaemuir in the 1960s and 70s, and Mid Auchinleck in the 70s. Towerblocks were also built on reclaimed land at Bay Street and these were renovated in 2010 at a time when other council housing was being demolished. 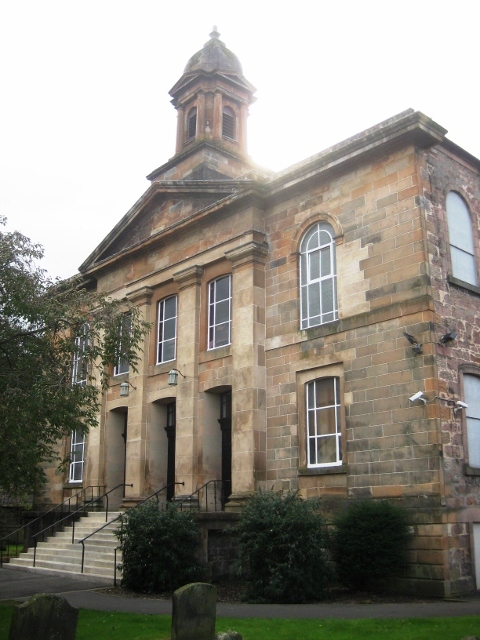 New council building continued in the 21st century, now managed, along with earlier schemes, by River Clyde Homes. The disappearance of the harbours, and eventually of the shipyards, the fundamental reason for the town’s existence, with all the related industries, has wrought the greatest changes of all. The filled-in harbour area is now a place of public recreation, the Coronation Park. And even that has been drastically changed due to more recent road re-alignments, with the A8 coast road to Greenock and Gourock cutting through the middle of the Park. The re-routing of the A8 was part of a major redevelopment of the riverfront after the closure of Lithgow’s Glen shipyard. 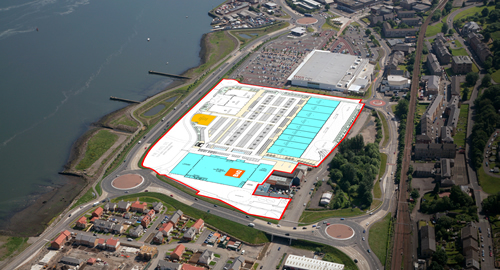 This large area is now occupied by a ‘retail park’, dominated by ‘the largest Tesco store in Scotland’ (when opened in 2008), which was joined by B&Q and Costa in 2014, while new low-rise housing covers the area to the west. The A8 now turns along the shore past the retail park, by-passing the town centre, which is largely un-noticed by through traffic. The old grid pattern of the early development of the town can still be seen today. 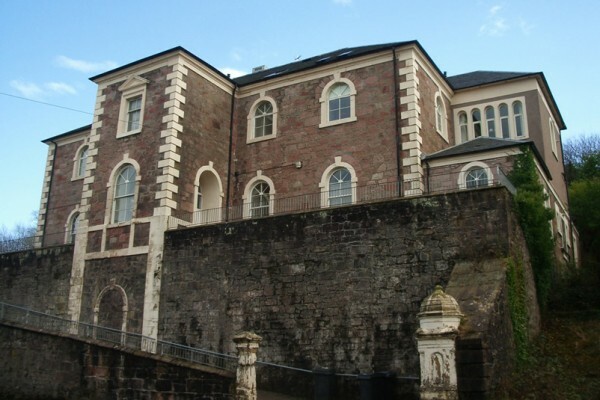 A good starting point for a walking tour is the Town Buildings, in Fore Street, originally by the side of the harbour. Now used as community buildings, including the local library on the ground floor. 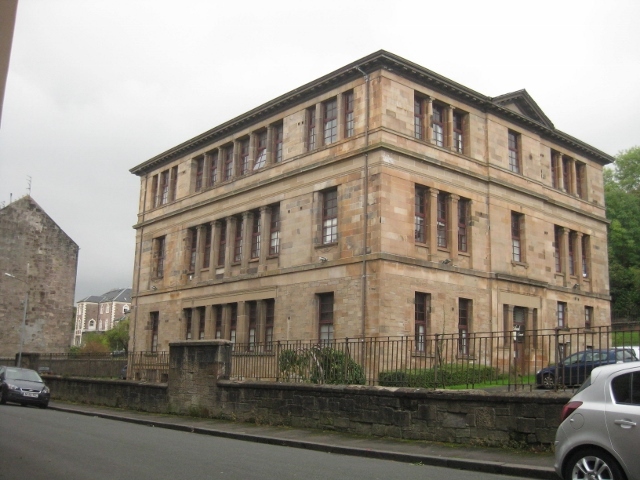 Port Glasgow Town Building, Designed in 1815 by Scots architect, David Hamilton. Now used as community buildings, including the local library on the ground floor. When built it stood on the waterfront! Leaving the Town Building, walk westwards back along Bay Street to the foot of John Wood Street (named after the builder of the ‘Comet”, the first passenger-carrying steam ship). The red sandstone tenements in this street have survived, buildings financed largely by the shipbuilding Lithgow family, to replace less than adequate housing. Most of the old shopfronts and fascias have also survived. At the top of John Wood Street, turn right along Princes Street. 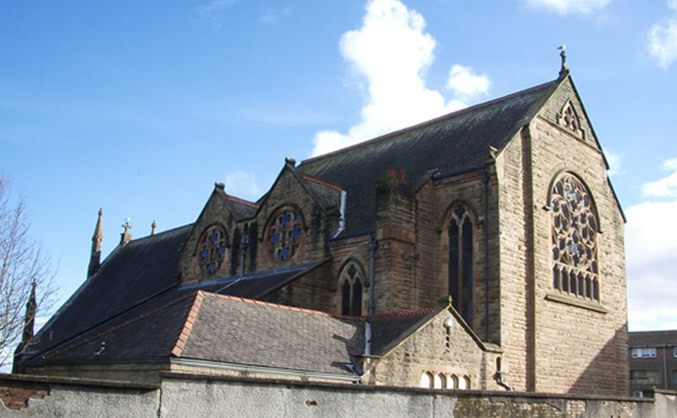 At its axis with Church Street, and forming a significant part of the old grid, stands St. Andrew’s Church, (1823), surrounded by the town’s first burial ground. 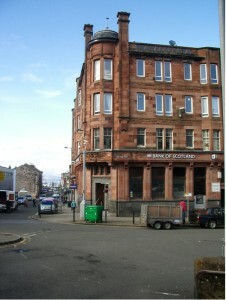 Also in Princes Street, are two classically designed buildings, formerly branches of the Clydesdale Bank and the Royal Bank, nos. 39 and 49. 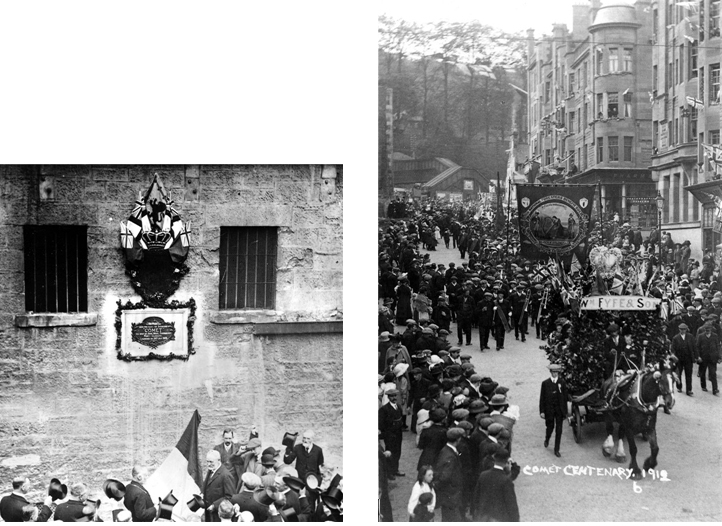 Running parallel to Princes Street, heading back towards the river, is King Street, where the Salvation Army has its premises. 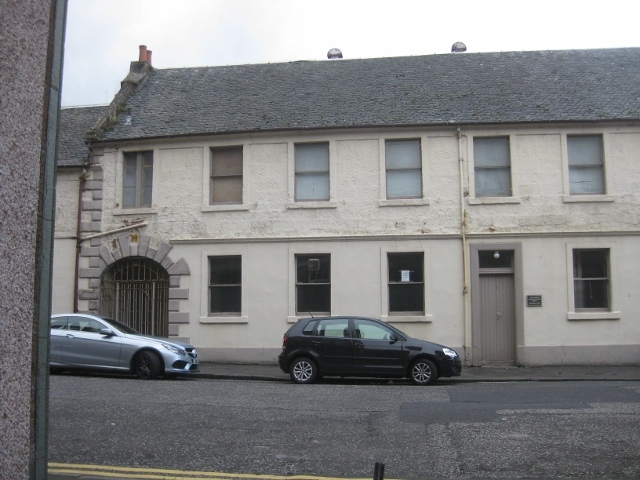 No.9 was built in 1746 as a Masonic Lodge, and has a high forestair at the rear. No. 11 once served as the Town Hall, built in 1758. It is longer with quoined margins and a segmentally arched pend leading into the back court. 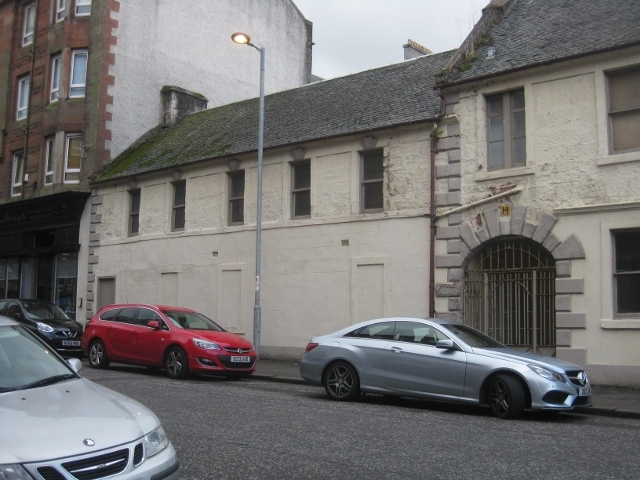 Continue along King Street, turning left into Shore Street, running parallel with the busy A8. This becomes Brown Street, looking onto part of Coronation Park, and the replica of the “Comet’. Here are some more examples of church architecture. 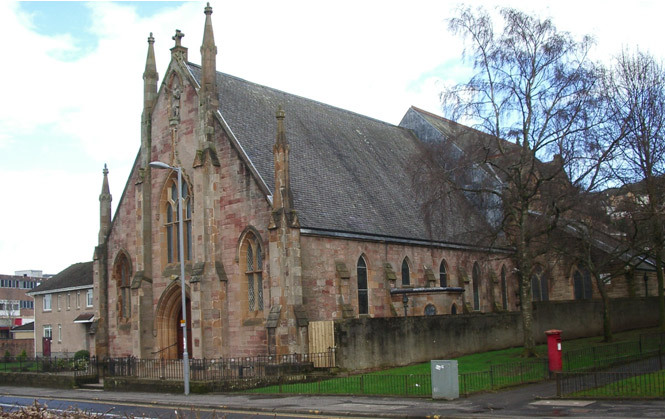 Port Glasgow United Reformed Church, 1883, formerly a Temperance Institute. West Church, 1885, designed by John Burnet. Now converted for housing. Turn left at the corner of West Church into Jean Street, going under a stone railway bridge. 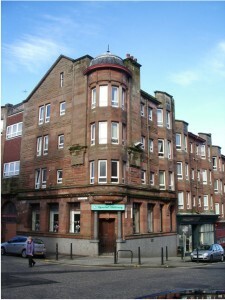 On the left, at the corner with Glen Avenue, you will find Jean Street School, now converted into flats. 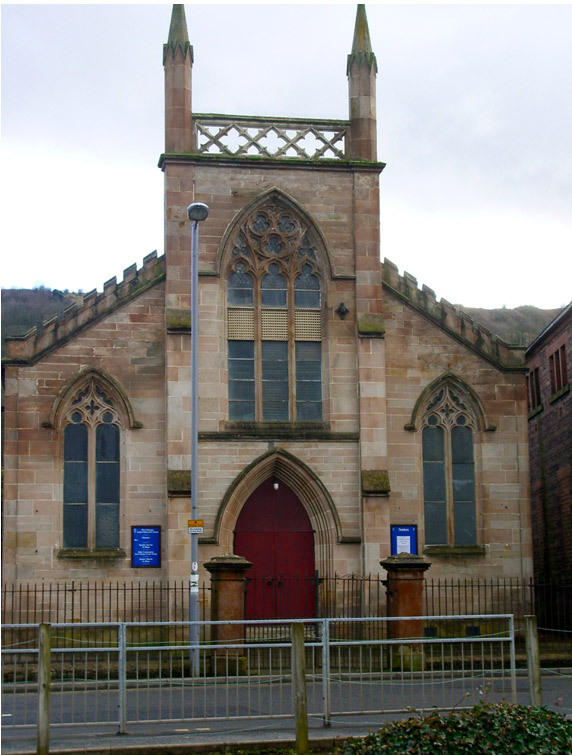 To complete the circle, standing high at the corner of Glen Avenue is the oldest remaining church in Port Glasgow, Newark Parish Church (1773-74). Now used for housing. 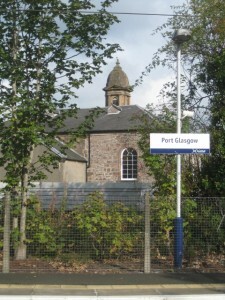 Just across the road from the church is the rear entrance to Port Glasgow Railway Station. Head back down towards the river, to Shore Street, turn right, and continue along Scarlow Street to Fore Street. Ahead you will see the Town Buildings, where this tour began. The imaginative sculpture “Endeavour” by Malcolm Robertson (2012) stands at the corner. On the opposite corner is the town’s war memorial. As you stand at this point, looking out to the river, it is difficult to imagine now the presence of the harbours that used to lie under your feet. 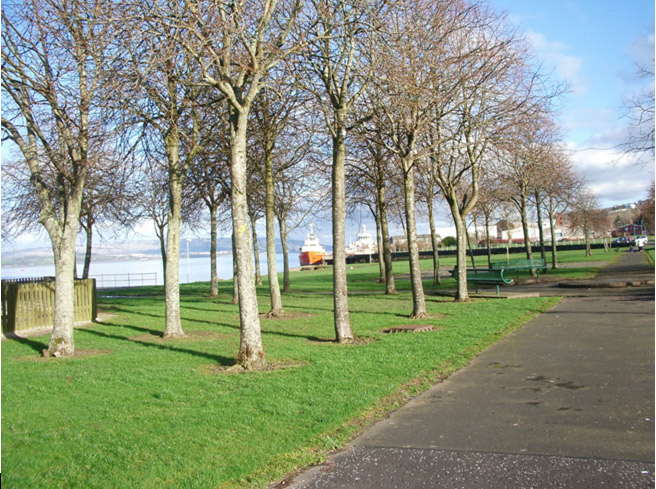 Beyond the main road, the A8 to Greenock and Gourock, lies Coronation Park, first proposed as a place of recreation for the people of the town in 1936. 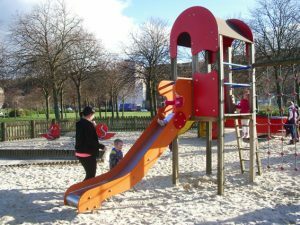 It has been altered, redesigned, and replanted several times since then, but today it still provides a very pleasant riverside area for local people to relax, stroll, and enjoy one of the loveliest views in Scotland. Continue walking east, towards the yard and Newark Castle. Despite the noisy presence of the busy main road, the paths at the water’s edge are quiet and peaceful, with views over to the Argyllshire and Cowal hills. 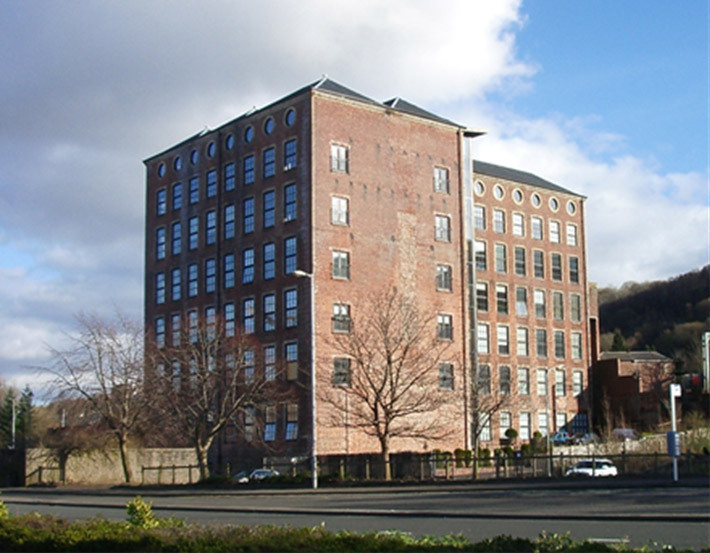 As you near the entrance to the shipyard you will see the Gourock Ropeworks, now converted into flats, another relic of Port Glasgow’s shipbuilding history. 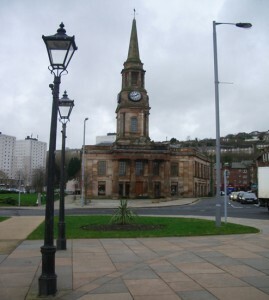 A side excursion to Port Glasgow cemetery can be made by crossing under the railway line at the roundabout and continuing along the road which runs south of the line for about a mile. The cemetery is built on a steep slope and from its higher ground there are stunning views over the Clyde and the southern Highlands beyond. 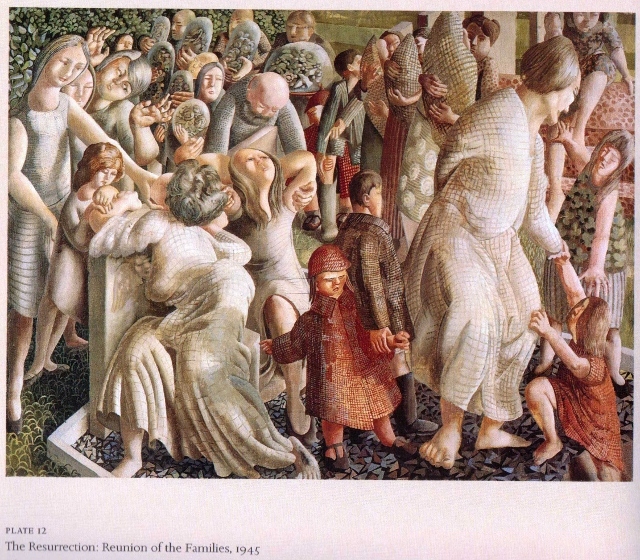 The cemetery was where the distinguished artist Stanley Spencer had a vision which resulted in his major work ‘The Resurrection: Port Glasgow’. Part of ‘The Resurrection’, ‘The Reunion of the Families’. 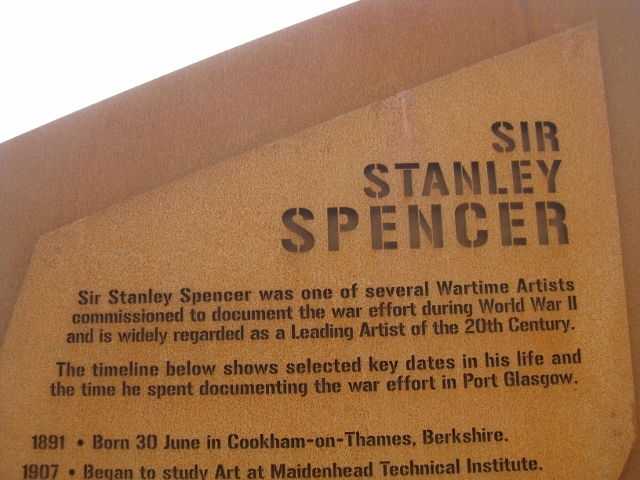 Spencer spent much of WWII in Port Glasgow as an official war artist, painting a large series of panels showing the stages and trades involved in building a ship. These are now held in the Imperial War Museum. 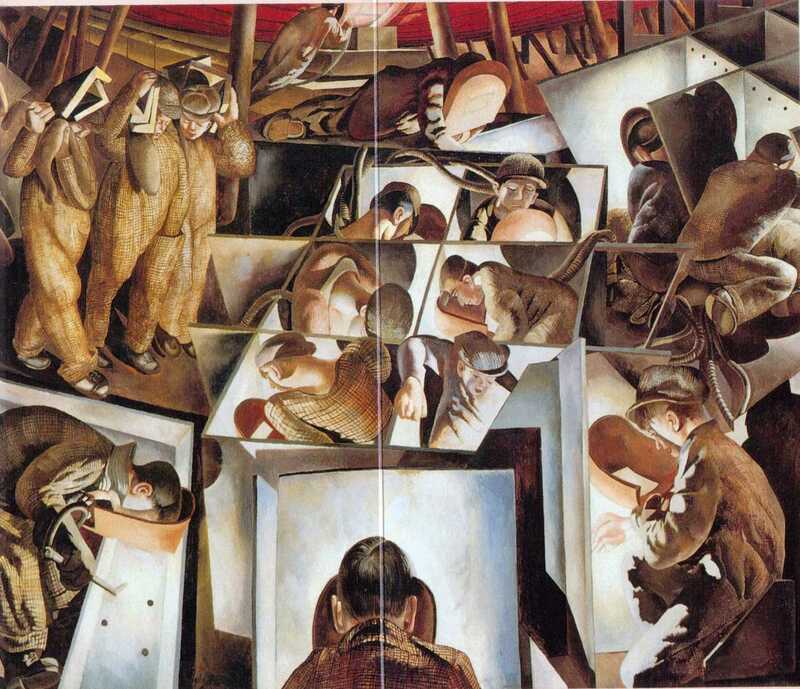 An intensely religious man, Spencer had a vision one night which led him to produce, after the war, a huge set of paintings showing the Last Judgement and Resurrection taking place in Port Glasgow. He painted several other Resurrection scenes. He envisaged the resurrection of the dead as an event in which the uncertain and sometimes unpleasant experiences of everyday life would be transformed into a calm, ideal world. 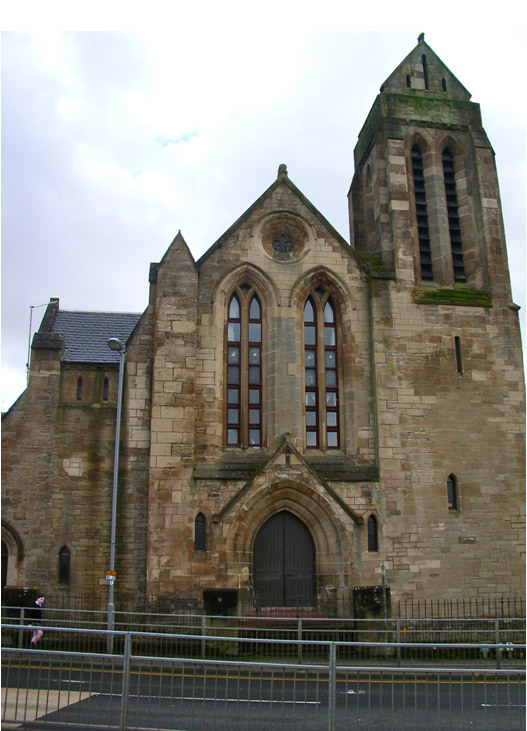 He enjoyed living in Port Glasgow and showed his affection for the ordinary people of the town in the scenes which make up the Resurrection project. Parts of the Port Glasgow ‘Resurrection’ are now held in art galleries in Preston, Birmingham, Dundee and Aberdeen. 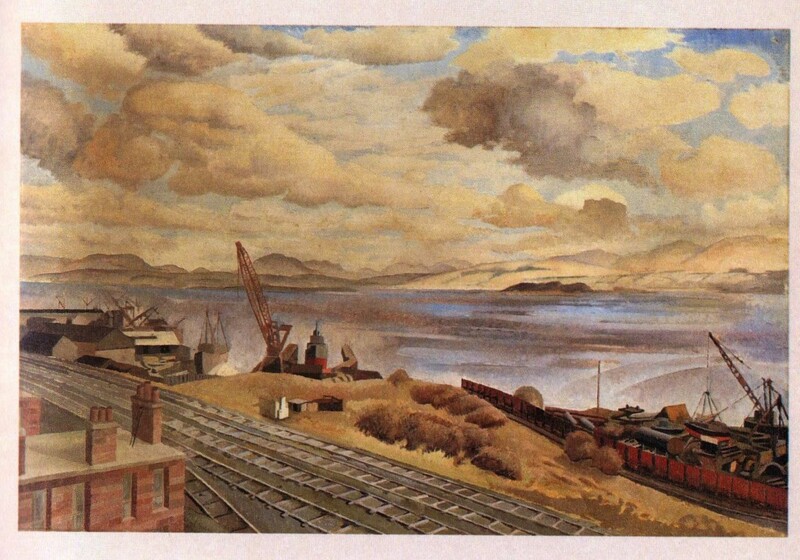 Spencer also painted views of the town such as this one showing a view across the Clyde from the railway. 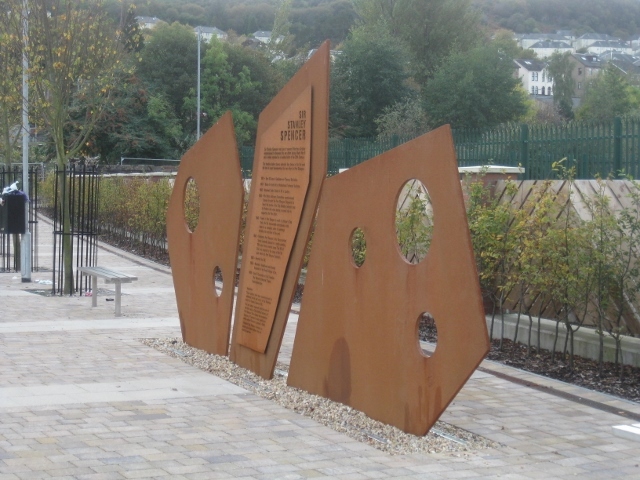 In June 2014 a sculpture commemorating the life of Sir Stanley Spencer, was installed beside the Glen Burn (just south of B&Q) in Port Glasgow. Continue on the riverside, past the entrance to Ferguson’s yard, and almost hidden at its side you will find the entranceway to Newark Castle. 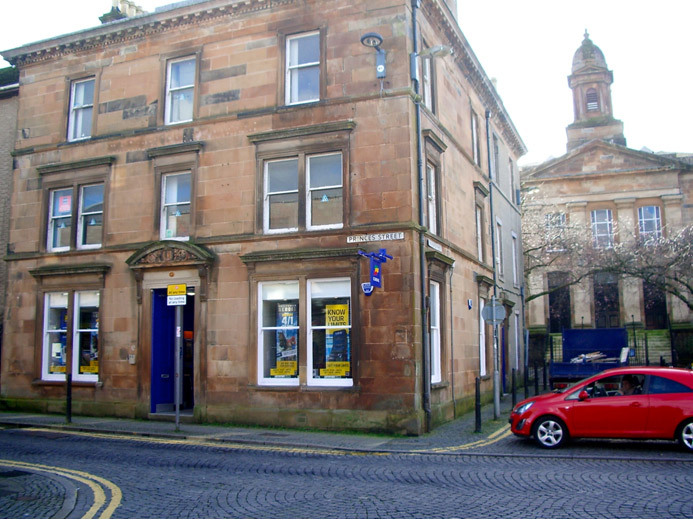 Where the history of Port Glasgow began. Today this is a peaceful spot, despite the presence of the yard alongside. The path continues along the side of the river and forms part of the Inverclyde Coastal Path which runs from Erskine Bridge to Wemyss Bay, where it is linked to the Ayrshire Coastal Path. &copy Copyright 2015 Friends of Wemyss Bay Station. All rights reserved.